NOTE: RECENT CHANGES TO THE DISPLAY OF THE BELOW CADD DRAWINGS WHEN USING FIREFOX HAS CHANGED MANY LINES TO A LIGHT GRAY INSTEAD OF BLACK. THESE DRAWINGS WILL DISPLAY PROPERLY IF ONE CHANGES THE DEFAULT FIREFOX ADOBE PREVIEW OPTION TO USING ADOBE ACROBAT READER OR ADOBE ACROBAT. GO TO TOOLS/OPTIONS/APPLICATIONS AND SCROLL DOWN TO PORTABLE DOCUMENT FORMAT AND CHANGE FROM THE DEFAULT PREVIEWER TO ADOBE READER. The drawings were prepared using any official C & O drawings available from the Chesapeake & Ohio Historical Society, Inc., on-site measurements, and photographs. All are in 1/4" scale and direction is railroad direction. Please note that as a result of a loop in the New River at Hinton, geographical North corresponds to railroad South, and geographical East is railroad West. The drawing typically refer to railroad direction – not geographical direction. Many were initially prepared starting with Generic CADD® and were subsequently transferred to VISUAL CADD®. CADD files in GENERIC CADD® format, VISUAL CADD® format, AUTOCAD DXF format, and AUTOCAD® format can be made available under terms limiting their reproduction and distribution. I will email the CADD files to any individual interested in closely examining the drawings upon their agreement not to reproduce and/or distribute copies. VISUAL CADD® has a free utility which permits viewing the drawing without purchasing the full CADD program. The linked Adobe Acrobat® files were printed to file and then distilled using Adobe Acrobat Distiller to architectural size paper in Adobe pdf format prints. You may print them and zoom in if one uses Adobe Acrobat Reader. Adobe Acrobat Reader 5.0 or later is recommended. Here is a link to download the free software Adobe Acrobat Reader. Typical file size is runs from 25K to 104K bytes. Areas which are "Hatched" with "Concrete" do not translate correctly and the hatch displays as a pattern of "+"s.
I will make N, HO, S and O scale copies available in pdf format upon an agreement not to reproduce and/or distribute copies. I have concentrated on structures for which The Chesapeake & Ohio Historical Society, Inc. does not have drawings, has only partial drawings, or although it may have the drawings in the archives, they have not been found or indexed. HINTON YARDS - A pdf scan of C & O Drawing No. 6281-A which illustrates the Hinton and Avis Yards. This document was done in four (4) panels as the original drawing is approximately 32" x 12" at a scale of 1/4" = 100'. Page 1 starts at the left and are arranged 1, 2, 3 & 4 horizontally. The drawing was revised to 1978, and therefore all track changes and structures removed prior to 1978 are reflected in the drawing. 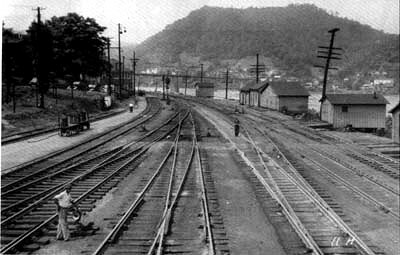 A larger scale drawing (1" = 200') of the Hinton and Avis Yards circa 1946 may be obtained from the C & O Historical Society - Drawing No. 6281 (Note no "A") which is approximately 24" x 110". 9. Interior Details of Monitor (from Fairbanks-Morse drawing). of Coal Dock. Solid Outline works best for viewing in Adobe Acrobat. 1. William Sparkmon's Drawings & Notes on the Chessie Coal Docks Note. 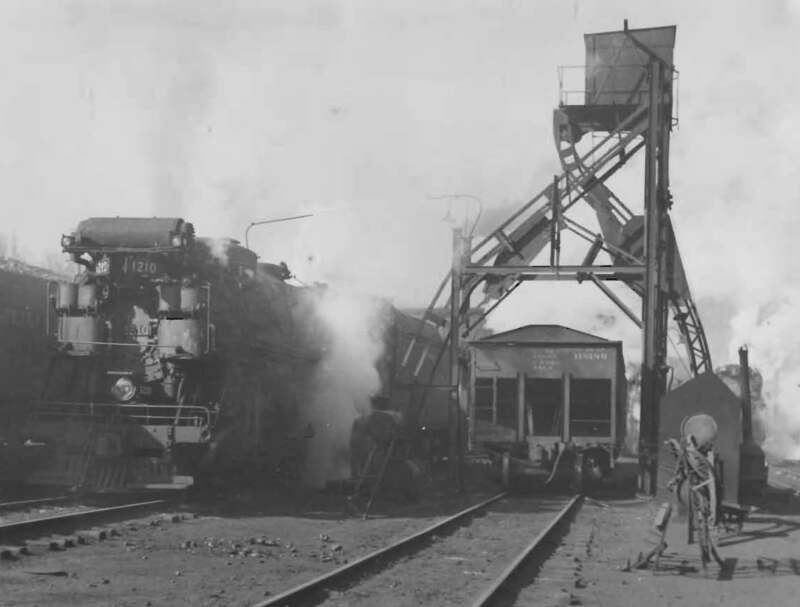 Stevens, Kentucky – Elevated Hoist House & Additional Internal Coal Bin, and Coaling Chutes. After 1948. Fulton Yard, Richmond, Virginia – Straight Hoist Shaft and modified Hoist House. be helpful to any modeler attempting to build a "Universal" cinder conveyor. Cinder Conveyor of Unknown type used at Hinton, Gladstone & Cheviot. Scaled from photographs and "re-engineered". See photo below of Cinder Conveyor at Hinton with Fairbanks Morse & Co. Universal Cinder Conveyor immediately behind. See April 2007 issue of the C & O Historical Magazine for photos of Gladstone. c) D&M Wash Machine Arrangement. (WORK IN PROGRESS) (Early partial draft). 10. 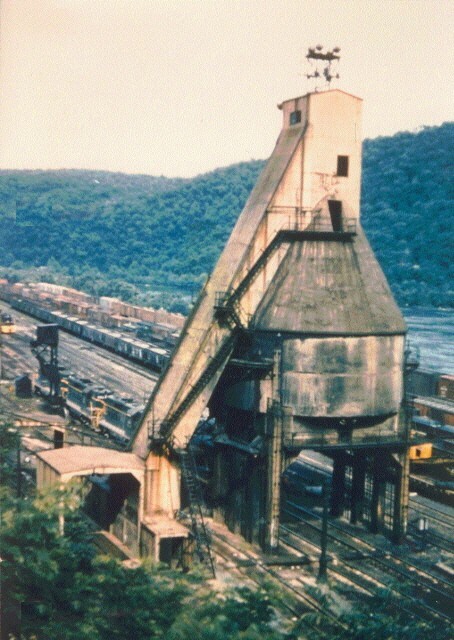 Robertson Cinder Conveyor Re-Arrangement (Hinton, WV/Phoebus, VA) Apparently was used at Hinton to de-cinder Steam Crane. The Robertson was located just west of the Ice House and was removed in 1943. 12. Assist. Yard Foreman's Office Bldg 51. Later became the Grand Central Yard Office. 13. Store Room Building 75. Attached to the Mallet Engine House. Converted from Materials Storage 1925, Retired 1940. 14. Engine Supply House Building 86. 15. Ice House Building 87. 17. Grand Central Yard Office Appearance of Bldg. 51 after it was moved to foot of Virginia Ave (Virginia Ave not open). COHS Photo: Used with permission (Photo contains "Hot Spots" identifying structures in MS Explorer). 7. 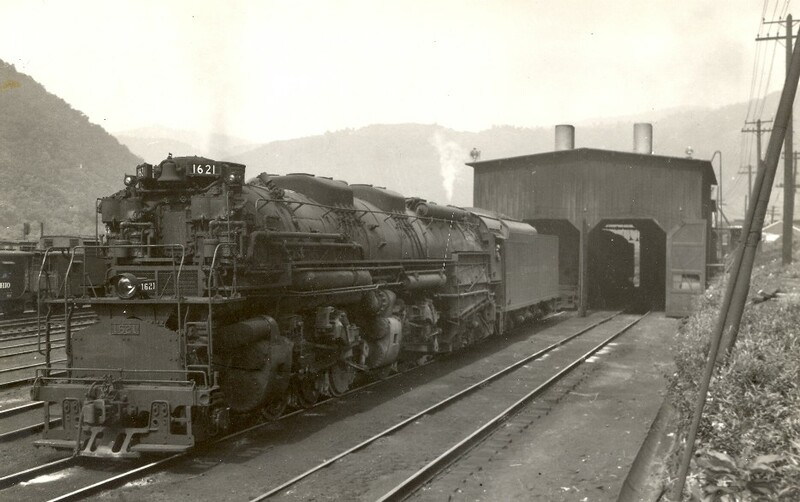 Ice House & Icing Platform Building 30 (1934) Before western ice platform added. a. "As Built" End Walls and Rear Panel Elevation (typical) drawings. b. End Walls and Rear Panel Elevation (typical) drawings after monitor roof was added (before 1916). c. Typical Section through monitor roof. b. Section through typical stall (12 thru 17). e. The Chesapeake & Ohio Historical Society, Inc. has drawings of the 1928-29 addition. e. The Chesapeake & Ohio Historical Society, Inc. has drawing of the 1942 addition. a. Firewall Addition of 1946 with existing firewall. b. Profile of Doors and extended stalls 1 thru 13. 7. Drawing of Proposed Concrete Block wall to seal east end of Roundhouse after Stall No. 1 was retired circa 1957. 8. Drawings of Machine Shop, Blacksmith Shop, and Carpenter Shop -- Note that the drawings of the Blacksmith Shop, etc., are based upon the known footprint (per C & O drawings), drawings of the proposed roundhouse dated 1903 which contain a railroad east elevation of the blacksmith shop (not as drawn here), a photo of the doors of the Blacksmith Shop or Oil House, a photo of the rear of the roundhouse in which one can see a roof monitor, and the drawings of the 1921 Air Brake Repair Room addition to the side of the blacksmith shop. The drawings is therefore an educated best guess and will be subjected to much further research. COHS #1403 (1947) Used with permission. 1. Framing Drawings As Built (1911-1942). Includes Plan View. 2. Exterior Elevations As Built (1911-1942). With drawings of various Monitors used. 3. Framing Drawings As Modified (1942-1959). Includes Plan View. 4. Exterior Elevations As Modified (1942-1959). 5. Mallet Engine House Situation Plan - Scanned from C & O Drawing. 6. Store Room addition to Mallet Engine House (Bldg. 75). 1. East Elevation Robert L. Hundman Drawing. Balance of drawings published in Winter 2012 COHS Magazine. 2. South Elevation Posted with permission of COHS. MX CABIN Controlled the entrance into the east side of the Avis Yards leading to the Alleghany Subdivision. 1. Standard two-story wood Cabin until 1942. 1. Tail Tracks added to turntable 1942. Scanned from C & O Drawing. 3. Ash Pan Thawing Devices. Scanned from C & O Drawing. 4. Universal Cinder Conveyor Scanned from C & O Drawing. 3. Johns-Manville Transite Smoke Jack (Found in engineer's file for the 1942 Roundhouse Extension. See Here for Actual Config.